Shopping for a 1 piece leather suit? Here are some off-the-rack options available for women riders looking for a good sport fit suit. Unfortunately there aren't as many options for 1 piece suits as there are separates, so here's what you have to choose from if you're not able to purchase a custom suit. $1,399.95. The fit profile on Spidi suits tend to be a bit longer in the torso, and slightly narrower in the shoulders. Check out my friend India in her 2-piece Poison suit. The fit is fabulous and great if you need more length in the body. This suit is perfect for the extremely petite riders out there. Pictured below is my coworker Sokrady, in a size 40 (5'3", <105-110lbs). She usually has a hard time finding anything that fits her right, and typically rides around town in her Tornado Jacket in 34. She recently acquired this suit and it fits her perfect! $799. I love the Motegi suit, it has a nice relaxed fit to it. I would say this one is the curviest fit overall but with a slightly shorter torso/arms/legs with a similar fit to the less expensive AXO suit. $600.00. The Talon Suit is on sale, $200 off MSRP! 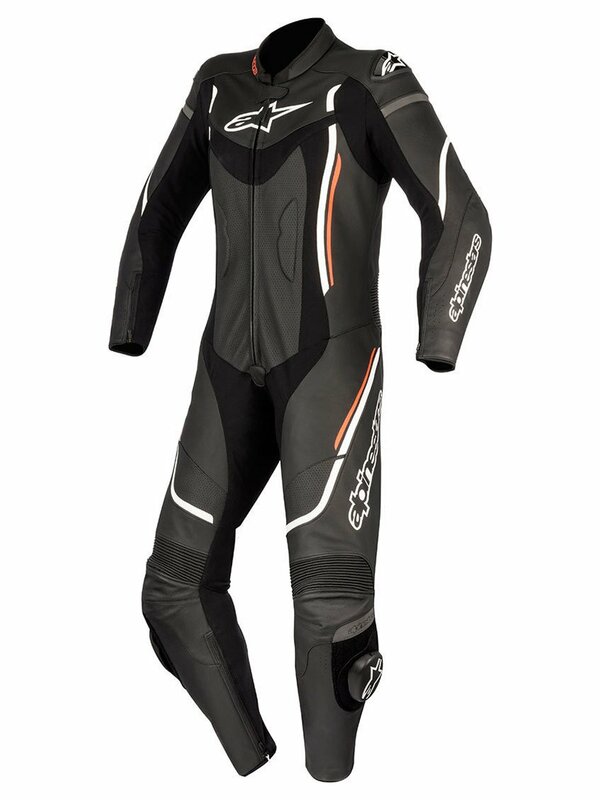 The fit is similar to Alpinestars, a tad on the curvier side with shorter limbs / torso overall. Do You Need a 1 or 2 Piece Leather Motorcycle Suit? A reader contacted me via Facebook recently and asked me what I thought about Spidi's 1 piece leather suits for women. The first thing I said was that they're outstanding. The quality is fantastic and they look incredible. I had to poke and prod this new rider a little more. She was about 20 and just starting to ride. I asked her why she was interested in a 1 piece and she said simply because it looked cool. I can't argue with how cool they look. I'd LOVE to wear one of these from Spidi. 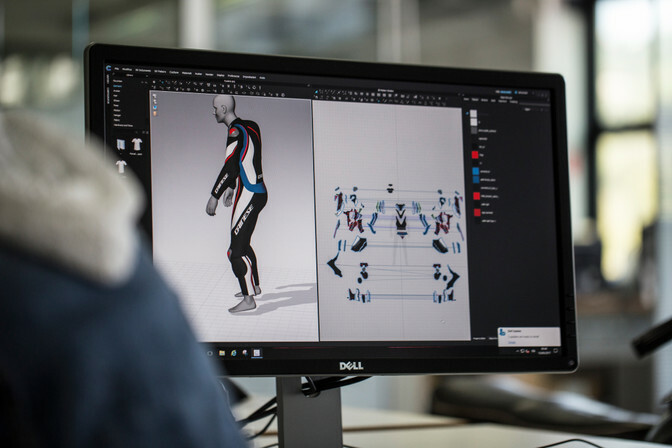 But I'd probably wear the one on the left (Trackster Touring Suit) more often than the one on the right (Mantis Wind Pro Suit). Mainly because I need the flexibility of a 2 piece when I'm actually out riding. And the Mantis is probably more aggressive in terms of fitment for track riding. Notice how the knees bow out a little bit on the Mantis, immediately forcing you into a more forward posture. But which one do you need? I guess the answer is both, technically speaking. They both offer excellent levels of protection while on the road, no matter what you're riding. But which one are you more likely to wear? Probably the Trackster. Given it's easier to take off your jacket, say if you're stopping for lunch. But on the other hand, I ride with a lot of friends who wear 1 piece suits for weekend rides too, not just track days or racing. And they simply zip off the top half to walk around or when we're sitting down for lunch. That's simply not my ideal method of wearing gear. It all comes down to what your preference is and which one fits you the best. Having ridden in 2 piece suits over the years, I absolutely love the flexibility and feel. I also tend to wear sport touring suits which aren't as aggressive in terms of fitment. They're designed more for touring and upright riding positions. I do wear the Revit Galactic however, as my summer riding jacket since it's so light and ventilated. It's definitely the most aggressive jacket I've worn so far. And it's not as comfy as my touring textiles. But I do appreciate the fit on my sporty. It almost supports me while I try and keep my upper body off the tank on long rides. Keep in mind also that 2 piece leathers come in many forms, not just racing. Take for example the Dainese outfit I'm in the photo at the very top of this post. The jacket is the Cage and the pants are the Firefly (discontinued awhile ago but they offer several other alternatives). I wore that outfit for my first novice track day. As a novice, it was the perfect outfit since I definitely wasn't planning on pushing myself to the racing, knee dragging limits. Although that jacket looks a bit 'race like' it's really not. It's far less aggressive and fits more like a casual jacket without the added articulation that you see on the elbows of the Galactic pictured right above. The fitments are really what tell the two apart. One immediately feels comfortable, doesn't immediately make me bend forward when trying it on and is definitely easier to wear overall. When I'm able to do track days on a regular basis, I will probably invest in a full 1 piece suit not only for the added protection, but comfort on the bike. When all you're doing is leaning forward and riding around a track, you want your suit to support you completely in that position. Remember that when you're venturing into leathers that there will be a break in period that's going to be uncomfortable (no matter what style or brand they are), completely out of your comfort zone and just plain annoying until they soften and loosen up. How much they break in varies from brand to brand, and type of leather to type of leather (kangaroo v. cow v. sheep v. goat, etc.). You could get anywhere from 1/8" up to a half size increase in fit. Just remember my shopping rules to ensure that you get the right size and don't forget those baselayers to help increase your overall comfort while wearing leather!